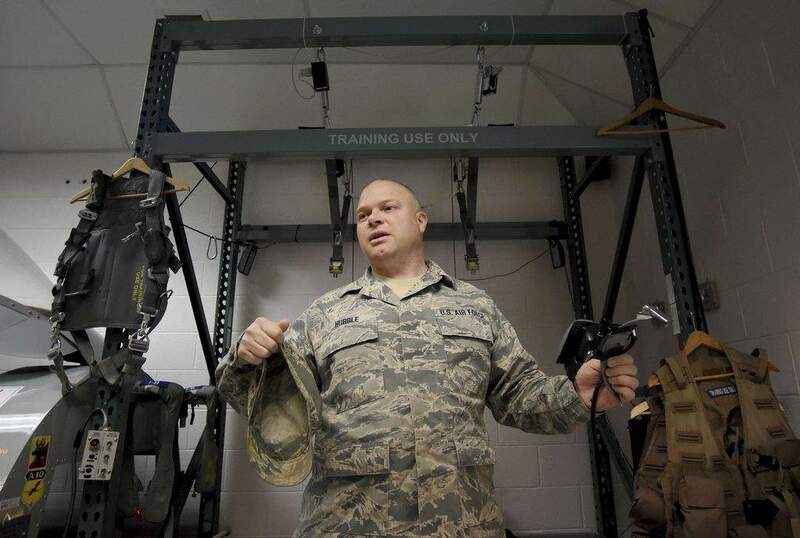 FILE: Master Sergeant Darin Hubble holds and talks about the egress hanging harness simulator, a virtual environment visor in the training room during a behind the scenes look at the 122nd Fighter Wing. Fort Wayne Air National Guard Base, IN – This morning at the 122nd Fighter Wing, due to the lack of appropriations, a portion of drill status guardsmen performing non-exempt duties were released at noon for the remainder of the regularly scheduled drill weekend. All federal technicians will report for duty on Monday and after four hours, non-exempt technicians will be placed on furlough. Exempt federal technicians and active duty Airmen at the base will continue to operate, ensuring that the 122nd Fighter Wing is prepared to support and defend Hoosiers and U.S. citizens.